Well, I wasn’t sure if this day was actually going to come. Butterfly Ward no longer has a curse. Those 2 1/2 years are over. It wasn’t by any means the work of me The Lord did it all. Gary starting interacting with missionaries over 30 years ago! It was a great day to see someone so happy to make the change. I haven’t seen someone so ready to change in so long. He was just glowing and kept saying this his new beginning! It was a little stressful though cause on Saturday we went to confirm that Gary was still ready but, his phone was off the entire day we couldn’t reach him. Then the next morning we had tried to call him again and he wasn’t answering so our ward mission leader sent us to go get him. We went down and we wanted to go to his door but the security guard was being tough, so we tried the intercom. To our pleasant surprise he answered right away and he was actually heading down. He was more than happy to be heading to church. Before this since he is wheel chair bound he has always worn a loose shirt cause he thought it would be weird to wear sweats with a nice shirt, but today he had a white shirt and tie and was completely prepared. Then to the other stressful part: we had planned for our other investigator Aaron and the sister missionaries investigator to play a violin duet and we had them practice once on Wednesday after that we couldn’t get a hold of him. So we were pretty nervous but thirty minutes before the baptism started they both showed up. MIRCALES! Interesting enough, even with how stressful the situation seemed I never once really worried. I hard a strong confident feeling the entire time. Which is great cause I was just really happy and relaxed through the whole thing. What a blessing. Then after we celebrated with our recent convert and our investigator at a members house for dinner. That’s basically the best part of my week! Oh and we had a really good Zone conference in the mission office! It was a combined one with the other zone so, it wast great to see some faces I haven’t seen in awhile! 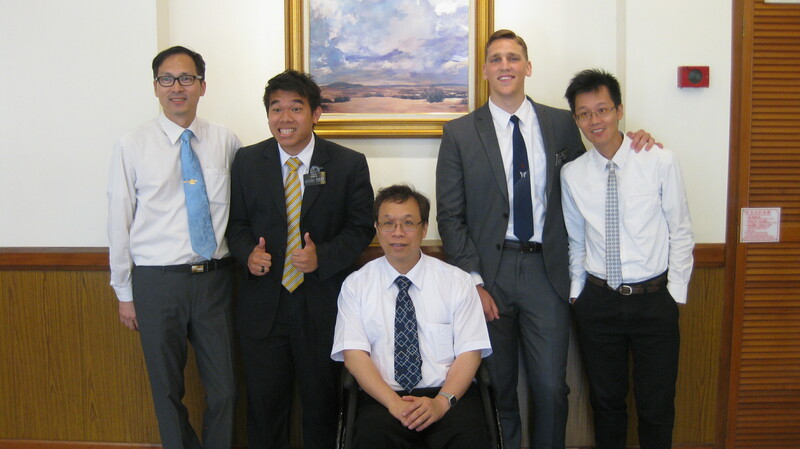 This entry was posted in Jared and tagged Baptism, Blessings, Butterfly Ward, Confidence, Elder Cordon, Hong Kong, Hong Kong China Mission, LDS, Miracles, Mormon, peace by shalesecordon9. Bookmark the permalink.